Shortlisting the best-fit candidates can be a tedious task. Jobsoid simplifies this process with Smart Filter Intelligence. Jobsoid Intelligence engine will automatically populate the skills from your job description and set them as required skills on your job posting. These skills are then matched with resumes of candidates and scored according to the relevance to your required skills. 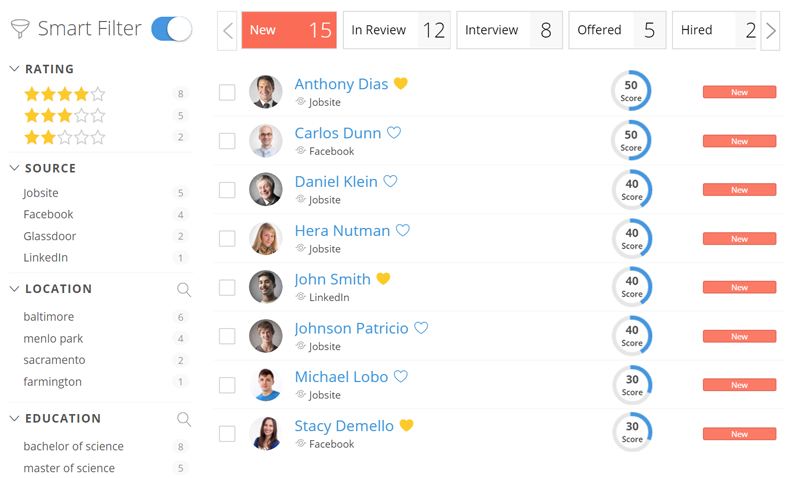 Smart filter then sorts these candidates to enable you to shortlist candidates easily and quickly. Setting the desired skills on the job opening. Go to Required Skills section on the New Job Opening or Edit Job page. You can either fetch the skills from the library or add them on your own. Jobsoid can add skills automatically based on your job description. Click on Fetch Skills button in the Required Skills section. The skills matching your job description will be populated with a default score. You can choose to increase or decrease the score by clicking on the arrows. To delete a skill, hover your mouse over the skill and click on X button. To add the skills manually, click on New + in the Required Skills section. It will turn into a textbox upon clicking. Write the desired skill in the text box and hit the enter button. The new skill will be added to the list with a default score of 10. You can either increase or decrease the score as per your requirements. Applying the Smart Filter on Candidate profile. Go to the Candidates tab on the Job Details page. The Smart Filter toggle is on the left-hand side of the screen. Set it to ON. The candidate profiles will be displayed in the descending order of their scores i.e. the profile having the highest score will be displayed on the top of the list. Note that you will be required to set the required skills in order to use the Smart Filter feature. The Total score shows the average of Review score percentage (eg. 5/5 = 100%) and Smart Score percentile.